Home / dole / fresh fruit / fruit / jon avila / pineapple / sm mall of asia / super fruit day / tuesday vargas / What a SuperFruit-ful Day! 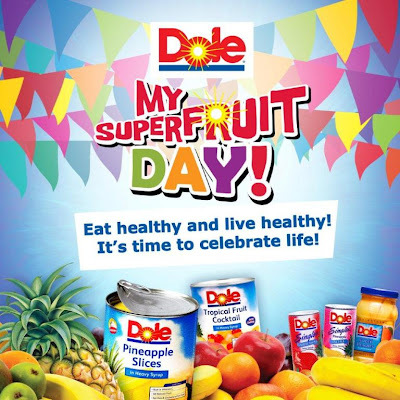 A tidal wave of fruits - that's what happened to the recently concluded and the first-ever My Super Fruit Day of Dole Philippines at SM Mall of Asia. I was surprised and happy to see how people and companies are taking a step towards healthy living, and at the said event, it proved that Filipino are starting to get conscious about their diet. Thankfully, there are these products that come very hand to all of us! The event showcased ways on how we can live a happy and healthy life through the help of fruits. There were booths where guests and participants can visit and get some healthy advices from the experts, there were also booths for fun and games, and lastly, there were booths for freebies and food. The day was totally and fruitfully enjoyable, and I personally had fun watching and taking pictures of the folk dance numbers, participants of the costume contests and the parade. The parade was attended by groups of people who were bagging to win the most number of contingents and the street dance participants from Higantes, Maskara, Panagbenga, Sinulog and Pahiyas Festivals. At the break of dusk, a mocktail was held where winning groups and individuals were awarded with giftpacks and cash prizes. The top winners got Php15,000 each, while the runner-ups took home some Dole goodies. The mocktail was hosted by Jon Avila and Tuesday Vargas who made everybody laugh and enjoy the day more. Cuisinart chef also shared some fruitful recipes to us that got moms and dads excited. Now, is there any fruitier summer happening out there than this? I DON'T THINK SO! Congratulations to Dole Philippines and to all the winners! Ang sarap ng mga pagkain! Yum-yum!